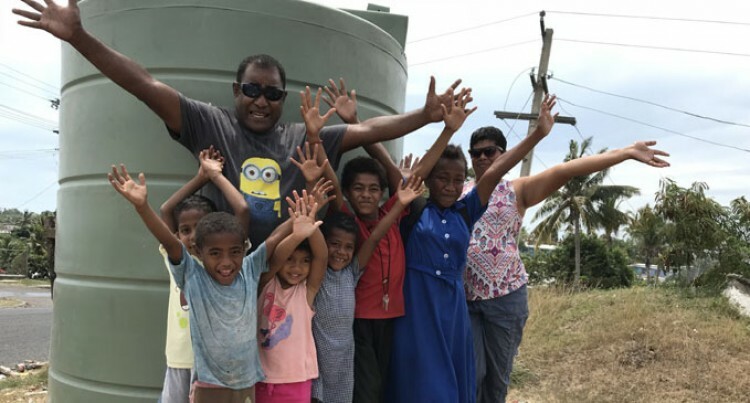 Vetaia Nabau has praised the Water Authority of Fiji for providing water tanks in their village ahead of the Nagado water shut down. “Before (five years ago) we used to wait for water trucks to come dur­ing water cuts,” said the Turaga Ni Koro of Tavakubu Village in Lau­toka. Mr Nabau said many households had to be without water for up to six to seven hours. However, the new system in place, where water tanks were positioned at one area instead of water trucks, was more convenient for the villag­ers. Mr Nabau said the new system pro­vided the villagers enough time to store water and ration it during the dry spell. The Water Authority of Fiji (WAF) has placed over 200 water tanks of 5300 litres and 10,000 litres in ca­pacity at strategic locations around Nadi and Lautoka in preparation for the Nagado Water Shutdown from September 29 to October 2, 2018. A total of 96 water tanks in Lauto­ka and 106 water tanks around Nadi have been placed at various loca­tions for the benefit of consumers. Water Authority of Fiji board di­rector Kamal Gounder has urged everyone to store at least 200 litres of drinking water and not wait for the weekend. “WAF will be working with the Fiji Police Force in the monitoring of water tanks, as reports of van­dalism and damages had surfaced during the earlier shutdowns—any complaints or reports will be for­warded to the Force for further investigation,” said Mr Gounder.